What's the difference between a New Keynesian and a New Monetarist? This sounds like I'm leading off to tell a joke (a duck walks into a bar...), but I'm not. A New Keynesian thinks that the real interest rate is too high, while a New Monetarist thinks the real interest rate is too low. In New Keynesian theory, the basic idea is that the key inefficiency that monetary policy should be correcting arises from the sticky price friction. It is costly or impossible for firms to change prices frequently, and if there is general inflation or deflation there will be relative price distortions that cause welfare losses. In the New Keynesian framework, price stability will generally fix the problem, subject to some slippage due to what the central bank can and cannot observe at any given time. However, a particular problem, which I think is the key to how New Keynesians think about the current state of the world, is that the nominal interest rate cannot fall below zero (the "zero lower bound"). In a severe downturn, from standard intertemporal economics, efficient allocation of resources dictates that the real interest rate should be low, but this is not going to be consistent with price stability and a non-negative nominal interest rate. The best the central bank can do is to set its policy target nominal interest rate to zero, and the real interest rate is then too high relative to what it would be in an efficient flexible price world. This is essentially the story that Bob Hall told on Wednesday, and it's consistent with all or most of the New Keynesian work I have seen at the SED meetings here in Montreal. From a New Monetarist point of view, a key element of the financial crisis relates to the scarcity of liquid assets. There is one type of liquid asset, which is outside money. Currency and bank reserves play their own unique roles as media of exchange in retail and large-scale financial transactions. A second important set of liquid assets are (in the US) Treasury securities, and various intermediated private assets that are implicitly traded through the exchange of various intermediary liabilities. When the Fed conducts an open market purchase of Treasuries, it swaps the first type of liquidity for the second. My view is that one reason this matters is that it increases the scarcity of the the second type of liquidity. The financial crisis also increased the scarcity of the second type of liquidity. For example, some mortgage backed securities, which had been widely traded in financial markets, and had served as collateral in various credit arrangements, dropped in value and were no longer traded. An increased scarcity of the second class of liquid assets is reflected in a lower real interest rate - these assets carry a larger liquidity premium. The correct central bank response to such a phenomenon, in additional to stepping in temporarily take up some of the intermediation functions that seemed to have shut down in the private sector, is to sell Treasuries, not to purchase them (which would increase the first type of liquidity, not the second). As you can see from this picture, which I lifted from Curdia and Woodford, this is pretty much what the Fed did in the financial crisis. 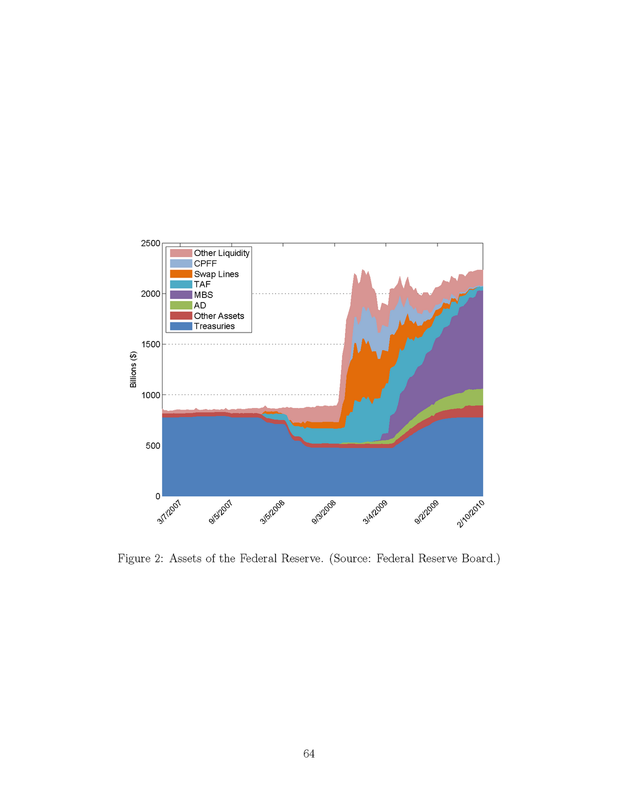 The Fed balance sheet expanded, but they actually reduced their holdings of Treasuries. The key point is that an important phenomenon in a financial crisis is a shortage of "type 2" liquid assets, reflected in a low real interest rate, rather than a real interest rate that is too high, as in New Keynesian theory. By the way, thanks to Ricardo Lagos for helping me think through this. Who are the New Monetarists? Name names! What are their favorite journals? Do they like Justin Bieber? The public needs to know more. Also, what are some good papers with models of liquidity in general equilibrium? 1. Fiscal deficits, financed by issuing money and/or Tbills, to reduce the scarcity of types 1 and 2 liquid assets? 2. The Fed buys illiquid assets, in exchange for types 1 and 2 liquid assets, which would reduce the scarcity of types 1 and 2 liquid assets, and also make the illiquid assets a bit less liquid because the Fed is creating a market in them? This post is useful to me, even if it might give me some sort of identity crisis. By the way, some of the stuff that Brad DeLong writes is not so dissimilar to this. There's a monetarist somewhere inside that Keynesian shell. So the Fed is providing dollars in exchange for Euros which will then be unwound at some point in the future. The Fed holds the Euros as assets which I assume are classified as reserves. The liability is the obligation to return the Euros. Why do the foreign central banks want the dollars? (a) Are they just buying mortgage backed securities from the local banks that made the mistake of buying them? (b)Just managing the exchange rate by selling dollars for Euros in an environment where everyone wants dollars? Why is the Fed doing this? Just because they are countries friendly to the US? Basic questions I'm sure but I'd sure like to understand. Thanks, this was a helpful post to those of us who are not professional economists. Any chance you could do an old monetarist vs new monetarist post? -They are lender of last resort for their banks. -Those banks have liabilities (and hopefully assets) in dollars as well. -Those liabilities periodically need to be refinanced (rolled over), and the consequences of running short of dollars might be severe. Think of it as a localized bank run if you wish, but in a foreign currency. -Those local central banks cannot 'print' dollars, and can only get dollars to lend their banks by selling (home country) currency. If they do this all at once on the open market, consequences may be severe. -Swap facilities with the US Fed gives those local banks access to US$ for such situations, reducing overall risk. -In 'such situations', they would provide liquidity facilities in US$ to their local banks (as they would do in local currency by simply crediting reserve accounts). -For the Fed, the counterparty risk of (at least some) foreign central banks is low and consistent with its mandate and powers. That's the argument. You can make your own judgment about how severe consequences might be, how far-reaching, how consistent, etc. But it's enough to look at the BIS reports to see that foreign banks have lots of foreign currency (e.g. US$) assets and liabilities, and the markets are big enough to be - potentially - quite disruptive should they stop functioning. Oh, and yes, there are other ways for foreign central banks to deal with these things - like capital controls, legally mandating payment delays in foreign currency liabilities, etc. Those might be worse solutions. But surely somewhere in a new monetarist model there must be something like an Euler equation that drives the consumption-saving decision at the individual or household level? And if, in the consumption-savings decisions and the corresponding firm level investment decisions the real interest rate that supports full employment (the natural rate) is negative would the new monetarists still say the answer is to make the real rate even higher? Not sure how useful this type x liquidity categorization is going to be. So there are type 1 and type 2 assets. Type 1 is outside money and type 2 definitely contains treasuries. A bit unclear what else is in type 2. Looks as if agency MBS are part of type 2, except when they are not. So the financial crises made agency MBS illiquid and pushed them into type 3? That is debatable. Once 'liquidity' becomes an important concept it would be useful to have an operational measure for that. Does the New Monetarism have anything to say about measurement? The Fed selling treasuries is then good monetary policy because it increases liquidity. How about the Fed buying agency MBS? I suppose if buying them increases their liquidity it is also good policy. But at some point agency MBS will again become type 2 assets and any further purchases of agency MBS are then reducing liquidity in the system? Would be good to know when that happens. What if agency MBS never really were that illiquid? As I said it would be nice to have operational measures of asset liquidity, if that is possible at all. Finally, I may be wrong, but this particular New Monetarist position on liquidity doesn't look that different from what Kiyotaki has been doing lately with various coauthors. They might be a step ahead of you, already synthesizing the New Monetarists with the New Keynesians. Some New Monetarists are Randy Wright (Wisconsin), Ricardo Lagos (NYU), and Guillaume Rocheteau (UC Irvine). Go to their academic web sites and mine, and read the recent publications and working papers. The type 1 and type 2 comes from a paper I'm writing - you can go deeper than that. Empirical work is the next step, and that is in reach. Nobu Kiyotaki I would call a new monetarist. His work with Moore and with Gertler is certainly related. Sometimes he's somewhat cavalier about where the financial constraints come from though. Ok, but assuming the problem is not enough liquid assets in the economy, then why have the Fed only sell treasuries; that exchanges one kind of liquid asset (treasuries) for another kind of liquid asset (cash). Why not increase both kinds of liquid assets? in addition to selling treasuries, create new money and use it to buy non-liquid (less liquid) private securities, like longer term private bonds. For economists not specialized in this area, and for well educated laypeople, why would increasing the amount of liquid assets (amount in what? principle value? market value?) increase GDP and/or employment? How would this work? What mechanism? More liquid assets (with higher interest rates if the Fed is selling them into the market) leads to what, which leads to what,..., which leads to higher GDP and/or employment? Wow, if one asset is swapped for another asset and within the banking system Treasuries are the most easily swapped asset with or without central bank then why does it all matter?